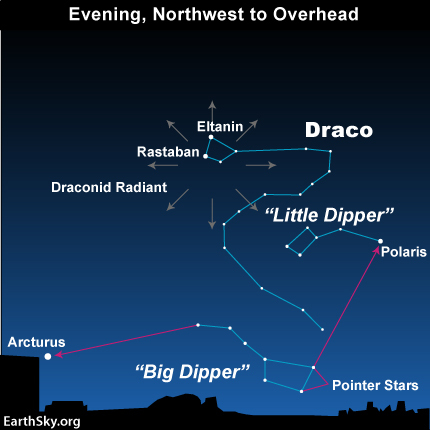 Draconid meteor shower — a great show in 2012? Listen: Tune into Space Weather Radio to hear live Draconid radar echoes. Can you see these rocks as they burn up? Or are they too small to make a visible “splash,” even though registering on radar? Heck, some reports say it’s even more active than that; Sky and Telescope reports up to 2,200 meteoroids per hour. How to tell? Go outside and look up! This entry was posted on Monday, October 8th, 2012 at 8:33 pm and is filed under Astronomy, History, Nature, Science. You can follow any responses to this entry through the RSS 2.0 feed. You can leave a response, or trackback from your own site.